OK so, yes this is another thread requesting recommendations for machine specs. I have perused the other posts but i wanted to try to get some opinions on specific mac hardware. When I was assigned this machine we were not doing much modeling and no rendering, this has changed to the point where modeling is 30-40% of my work time and I render multiple views of every model. So if I understand correctly, Sketchup only uses one core, so clock speed is important (as well as VRAM) for modeling in SU while Podium (not Pro Walker) is mainly dependent on the number of cores for speed. Feel free to correct me if I'm wrong here. The standard iMac has the fastest processor available (4.2 i7) comes maxed out at a quad core with 8gb Radeon Pro 580. While I am stuck using mac hardware, I can bootcamp to windows os which theoretically would allow me to use pro walker GPU, but obviously wouldn't be able to take advantage of GPU acceleration without an Nvidia GPU. Where I'm looking for opinions is in figuring out if clock speed between these processors is the most important or the number of cores (and what level of importance the GPU's play in the overall picture). Also I believe I read that the next iteration of podium may be more reliant on the GPU as well and I will need to future proof myself as much as possible as I will likely be using this machine for the next 4-5 years (if I'm here that long, ha!). As always any help is much appreciated. Personally I would go for the iMac Pro because it has way better graphics. Once you get a high spec Xeon or i7 the clock speed should be easily enough to cope with an SU model. The processing involved is only really for things like plugins which do a lot of number crunching. Redefining lots of components will use the CPU, but most of SU’s issues are related to the model display. Load your model up and manipulating it becomes sluggish. This is where the graphics card is crucial. ProWalker uses Nvidia graphics, but there is apparently a version of Iray for the Mac. The next version of OSX has support for external graphics enclosures allowing you to add Nvidia cards. I have no idea whether there will be a Mac version of ProWalker even with a Mac version of Iray. ProWalker is fabulous for exteriors (it’s very, very fast), but for interiors with low light and where indirect lighting is far more important, Podium is better. ProWalker can produce great results for interiors, and you may not notice any issues at all. Fundamentally however, for the moment if you want ProWalker, you need PC hardware with Nvidia graphics. You can’t mess around with a Mac. If that’s your limitation, then it’s Podium only, and you’ll have to wait for OpenCL support with the render engine. Personally I wouldn’t consider a normal iMac for 3D. Pro or nothing for me. It might be ideal with an external GPU enclosure and boot camp, but you have no idea how well it will work. If you are going the podium route as apposed to prowalker (or maybe even with) then you may want to consider a 2nd machine. A render machine. This is what I have so that my main workstation is perfect for quick renders but if I need a high quality one, I throw it to that machine and my main workstation is free for me to do other work. If you were going that 2nd machine route then, you want a lot of cores so I would recommend an amd ryzen build with a high core count according to your budget. Thanks for your input. We will see what happens and I will keep you updated here. Unfortunately, I am stuck with mac, and Hackintosh is out (from what I understand the future of Hackintosh is really in question with Apple bringing its processor production in-house) like I said it is a large institution with wide-ranging administrative protocols, so I will have to work within those constraints. Things would be much easier if a windows machine was an option, but for now it is out. I have to find out how long I have left on the lease for my machine. The less time left the more leverage I have to push for what I really need. 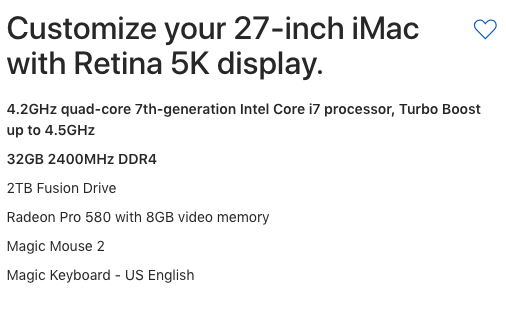 If I am able to go ahead with the immediate upgrade I'm going to aim for the fastest iMac pro I can, if not I may hold out to see what the new Mac pros have to offer.